rainfall, diurnal temperature variations and hydrology. The holistic combination of these components gives wines their unique sense of place. In the Old World. In the New World, we are more inclined toward grape varieties than geography. But not all grape varieties. There are around 1000 vinifera grape varieties. The more obscure have magical names like, Falanghina, Assyrtiko, Touriga Francesca, Ortega, Norton, Petit Mansang, Muscat Frontignan, and Uva Rara. The sciences of land, water, air as it relates to plants are important factors to consider when you find that wine you love. Even more important than vintage, in my opinion. While vintage does make a difference if you’re intending to age a wine, most wines are consumed within a year of being purchased. Fluctuations from vintage to vintage are not as dramatic as it had been in the past. Especially in Washington State. Modern technology gives the viticulturalist the advantage despite what Mother Nature may throw their way. The biggest risk is a freeze that kills the vines. Something that has happened in 2006 and in 2016. Recovery is slow and yields are low. Another recent difficult vintage was 2011 because it was a particularly wet year at the wrong time – harvest. Rain at harvest will plump up the grapes with water and the resulting wine will not be as concentrated as in other, warmer years. Another small menace for vineyards in a low lying pocket is a spring frost that can interrupt bud break and reduce the crop size. 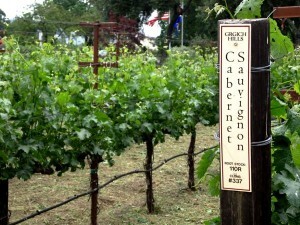 Today, this condition is carefully monitored with sensors in the vineyards talking to computers in the lab. This allows immediate action with water and/or smudge pots so that Mother Nature rarely gets away with very many bunches. Temperature and diurnal swings are another big factor. Some vinifera grapes like it hot. This is ok if there are the accompanied cool evenings and/or morning fog that are responsible for those balancing acids. Heat seeking grapes soak up all that warmth from the sun and the soil and that produces fruit sugars. Warm to hot climate grapes such as Cabernet, Grenache, Sauvignon Blanc, Petite Sirah, Syrah, Sangiovese, Tempranillo, Viognier, and Zinfandel are the heat lovers with lots of fruit sugars. Eastern Washington, the vast vineyards of California’s valleys, France’s Rhone and Provence regions, Italy and Sunny Spain are examples of warm areas that these grapes perform well in. However, these regions have another important factor; the nighttime temperatures and cool morning fog allow the acidity in the grapes to flourish. Acidity is that refreshing taste that balances the sweetness of a wine. Acidity is also responsible for preserving color, keeping those red wines red and white wines yellow. There are several types of acidity, all playing their key function. The most significant are the tartaric and malic acids, with a minor role by citric acid. Acidity, as any home canner knows, also plays an essential role in preventing bacteria from forming. One exception to this rule is lactic bacteria. Most wineries will inoculate their wines with this bacterium to change the sharper malic acids to rounder lactic acids. This gives a wine, both red and white, a fuller, creamier mouthfeel and is responsible for the buttery flavors in a Chardonnay. As always, balance is needed otherwise without the refreshing malic acids; your wine will be flabby. One other significant factor regarding acidity. It is essential for wine and food pairing that the acidity be present to contrast, compliment and cut the fatty proteins in foods like cheese, meats and fish. Just try a bite of seafood without a squeeze of lemon and you’ll know what I mean. Cool climate grapes are slower in the production of sugars, develop acids more readily and mature at a more leisurely pace. Cool regions have the morning fog hangs over the vineyards; cool evenings and north facing sites that shield the grapes from the hot sun. Oregon’s Willamette Valley, home of David Lett aka Papa Pinot, is renowned for their Pinot Noir, Pinot Gris, Chardonnay, and Riesling. All cool climate grapes. Named for the river that flows through it, the Willamette Valley has over 200 wineries and 15,000 acres of vineyards growing grapes in the valley that has those fog covered mornings. Most of this foggy region is about 100 feet above sea level with the highest point in the sub-AVA of Chehalem Mountains, around 1,633 feet above sea level. France’s cooler Burgundy, Chablis, Champagne and Alsace regions are also produce very fine wines from their more northerly vineyards with much the same grapes listed above. Even further north are the chilly vineyards of Germany, growing mostly Riesling, Gewürztraminer, Müller-Thurgau and Dornfelder and a smattering of Spatburgunder (Pinot Noir) here and there. This weekend, there is a wine tour much closer to home in the Puget Sound American Viticultural Area, a uniquely sunny area surrounded by a rain forest, farmlands in the valleys and Puget Sound. The Olympic Peninsula Wineries are hosting their annual Wine, Cider & Chocolate Tour, February 18th, 19th, and 20th from 11 a.m. – 5 p.m. Enjoy the scenic peninsula towns of Port Angeles, Sequim, Port Townsend, Chimacum, and Nordland (Marrowstone Island) and the wineries and cideries that produce some award winning products. Tickets will get you to a special commemorative wine glass, complimentary wine tasting and chocolate samples at Alpenfire Cider, Camaraderie Cellars, Eaglemount Wine & Cider, FairWinds Winery, Finnriver Farm & Cidery, Harbinger Winery, Marrowstone Vineyards, Olympic Cellars, and Wind Rose Cellars. Online tickets are $40, and $45 day of at participating wineries. Visit www.olympicpeninsulawineries.org for further information. Participants who have their ticket stamped at all 9 of our wineries will be entered into a drawing for an elegant wine themed gift basket. Hope to see you in our own unique terroir this weekend!